Wakesurfing’s rise in popularity has been fast and expansive and for very good reason. Unlike wakeboarding, surfing is chill, social, low impact and fun for all ages. 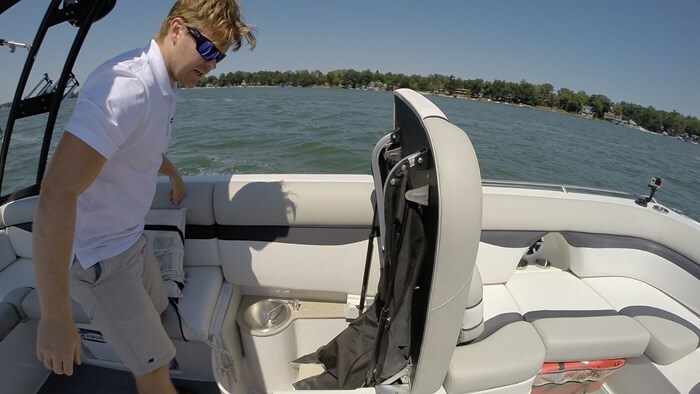 There is limited risk of injury, you’re close behind the boat and can talk with your friends while you’re doing it. There’s no risk of catching an edge and peeling your eyelids backwards like you can with the higher speed tow sports. The problem with wakesurfing is that since you are very close to the stern of the boat it is only safe to do so behind an inboard powered boat. Surfing behind an outboard or I/O powered boat is highly dangerous and is not recommended because of how close you are to the propeller. That is until now. 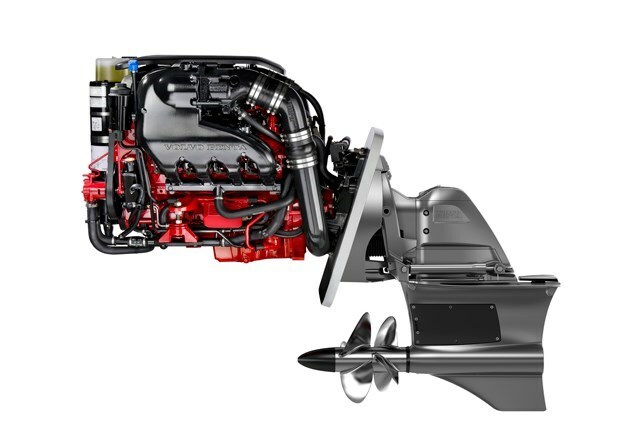 Volvo Penta has introduced a new I/O drive that places the propeller on the front of the outdrive, tucking it up much farther under the boat, a safe distance to surf. I had the pleasure of testing this out first hand on the 2016 Starcraft SCX 231 IO. 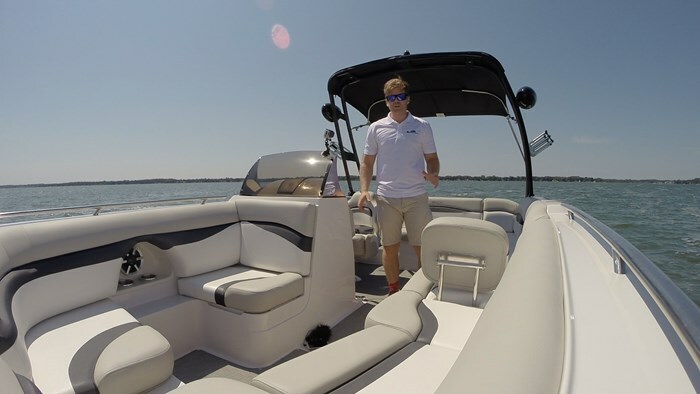 Starcraft’s SCX is their high end line crossover sport boat that blends the performance and styling of a runabout with the interior space of a deckboat. The SCX’s trademark is the picklefork bow design that allows them to carry the beam of the boat all the way to the tip. What this does is gives them one of the largest bow lounges in their segment. They make use of this with their “quad pod” seating arrangement that gives you four individual seats that you can sit around a removable table, family style. But what you can also do is put in filler cushions to create a massive lounge. Aside from size difference, there is also the choice of a dual console, full windshield model or an open concept, side console like the model I tested was. This layout is a more traditional deck boat style layout that is very common place in the Southern States, especially Florida, but it’s slowly increasing in popularity North of the border. For good reason too, the amount of space you get is phenomenal and it’s a far more social lay out as there is less of a conversation area divide. Here everyone can be part of the fun. With all of the seating in the SCX 231 you would be right to assume that it also has plenty of storage. There is cooler storage, along with storage bins under the cushions. There is a large, deep in-floor ski locker that would also be a great spot to add some ballast - but more on that later. The SCX 231 features a starboard side, transom walk through that gives you access to the swim platform. A nice touch was stepping out onto the Starcraft branded, soft touch Seadek matting that was on the swim platform. Along with it’s picklefork bow, the SCX is also known for its exceptional stern lounge. There is a rear facing bench seat, along with cup holders and a wet storage bin. Depending on what options you choose you can also get speakers, a stereo remote and a shower to name a few. The rear bench seat shares an “A” frame style backrest with the cockpit bench seat. With a simple lift of a lever, a lift and pull and this backrest transforms into a large sunbed. The helm on the SCX 231 IO, again, is a “side console” style helm that’s automotive inspired. It has a stylish wheel that tilts, full Starcraft branded gauges along with chrome bezeled hoods. There is a spot to flush mount a GPS or go with the optional Starcraft Murphy interactive touch screen unit. Since this boat was also part of Starcraft’s new “Surf Series” it featured Zero Off Speed control, ballast switches and surf tab controls. These are all an absolute must if you’re going to seriously throw your hat in the wakesurfing ring. For such a simple water sport, it requires pinpoint precision of attention to detail. Where you put weight in the boat, speed, trim, they all have an effect on the wave the boat produces and can make or break your surfing experience. These are all things surfers look for and will scrutinize with a magnifying glass. Before getting behind the boat I wanted to test out the high speed performance of the SCX especially since it was my first time water testing the new Volvo Forward Drive. I have driven many SCX’s in the past so being quite familiar with its running characteristics I was looking forward to see if there was any change with the new propulsion. Trimming all the way down and hammering on the throttle, the 231 shot to life! The bow rose up moderately then immediately dropped and began settling on plane. SCX’s usually have great times to plane because of their Dihedral hull design, but this was something else. I recorded a time to plane of a lighting fast 2 seconds! The Volvo Forward drive is a “pull style” drive to the propeller, it pulls at the water rather than pushes. What this also means is that there is always clean water for the propellers and it was clearly evident this has a positive impact on performance. Straight line tracking was smooth and stable as the the aggressive reverse chines of the SCX increase stability not only at rest but also when running. There was so much power with the 300-hp Volvo Penta that I didn’t need to trim very much to get the boat into optimal running conditions. Cruising speeds were a very respectable 25 mph at 3500 rpm and 31 mph at 4000 rpm. To be able to see such a jump in speed with a minimal jump in RPM means you’re working with a very efficient package, which of course will save you money at the gas pumps. Putting the throttle all of the way down and trimming up a bit more I was able to reach a top speed of 46 mph, a fantastic speed for this size of boat. I would be interested to see what the 231 would be capable of with its max horsepower of 350. But that would be merely out of curiosity as the 300 was more than ample. I think what impressed me the most was how well and how tight the 231 cornered without cavitation. IO’s can be finicky when it comes to the trim setting and cornering. If you don’t have it set just right or you turn too tightly you run the risk of cavitation and losing a good connection to the water. This wasn’t the case at all with the Forward Drive. Again since the propeller is at the front of the drive it has a constant supply of clean water, allowing it to remain hooked up as you turn as tightly as you can. The 231 showed it’s sport boat side as I tried full lock turns in both directions and it handled them with ease and showed the nimbleness of a much smaller boat. More than satisfied with the “driving” portion of the water test I was now ready for the fun part of getting on the board and testing the wave behind the all new Surf Series SCX. If you’re familiar with wakesurfing the trick is to load the boat up with ballast, cruise at a slow speed (ideally 10mph) and the hull of the boat creates a never ending wave that you can surf without holding onto a rope. The characteristics we look for in a good wave is height, length, cleanliness (no wash) and push. You can’t have too much of any one element, it needs to be a balance of all elements. Before jumping in the water I waited until our ballast was full, then brought the boat up to 10 mph. Being a right foot forward surfer, I surf the starboard side of the boat so I set the surf tabs to clean this side of the wake up. Now one thing you can’t do on an inboard is control the trim, but with an IO it’s a luxury that has a huge benefit. By trimming the drive up, you drive the stern of the boat into the water, increasing the size of the wave. Additionally, what it does is sends all of that water energy into the wave, as I would soon find out has a tremendous effect on the wave. Satisfied with the set up I hopped in the water, got ready, and told my driver to go. Once up on the board, I pulled myself with the rope in the “sweet spot” of the wave, the area that pushes you forward. Once I found it I tossed the rope into the boat and started to surf. The reality is that inboard towboats are expensive and out of reach for many. 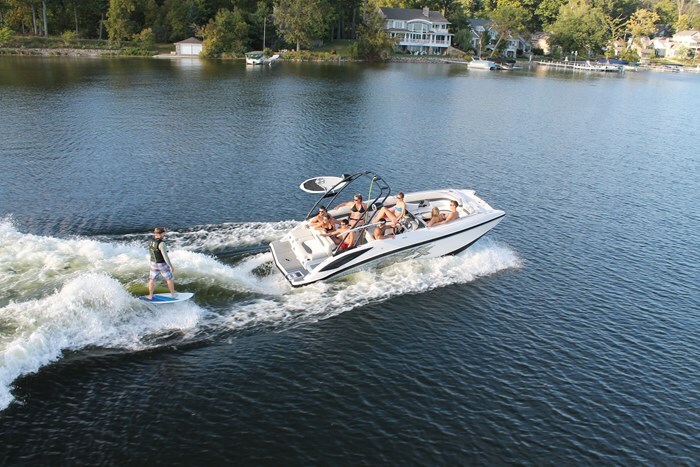 While you could always wakeboard behind an IO boat, you could never surf them. That has now changed and the Starcraft SCX 231 has shown me that IO powered surf boats are a reality and to be taken seriously. 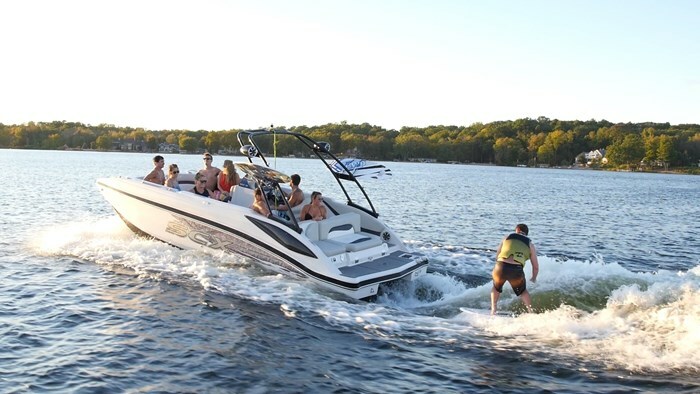 Inboard boats better start looking over their shoulders, there’s a new wave of surf boats on the horizon and it’s boats like the Starcraft SCX 231 Surf Series leading the charge.